Expanding A-Z File stores anywhere: desk, credenza, closet, car or wherever it is needed. 21 pockets are labeled A-Z for filing materials in alphabetical order. Each pocket expands to 7/8". 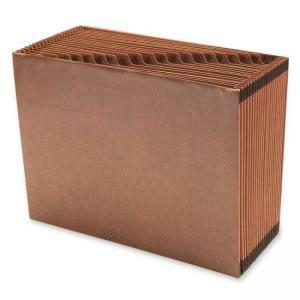 Tyvek reinforcement at the top and bottom of gussets and extends into front and back panels twice as far as any standard expanding files for super Tuff bonding strength. Extra thick reinforcement linear-board and double-thick front and back panels. Leatherlike expanding file without flap contains 30 percent post-consumer material. SFI Certified.